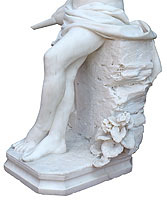 An Italian 19th Century Carved Carrara Marble Figure of a Standing Young Boy with a Mandolin. 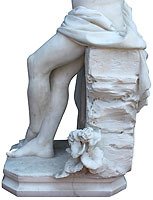 The standing figure of a young boy with crossed legs, semi-naked with a blanket around his waist, leaning on a rocky outcrop with wild plants at the base and holding on to his mandolin to his right and his left clenched hand by his chin. Signed and Dated: Victor Fucignas - 1897. 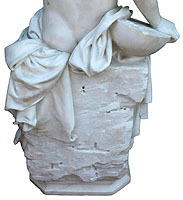 There is not much information available on Victor Fucingas other than he was an Italian sculptor based in Rome, Italy. 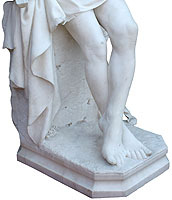 He is also known by his carving of the Carrara marble altar at St. Francis Xavier Rectory in Brooklyn, New York. 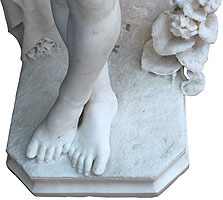 An Italian 19th Century Carved Carrara Marble Figure of a Standing Young Boy with a Mandolin. 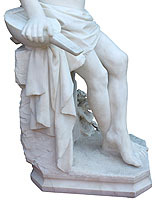 The standing figure of a young boy with crossed legs, semi-naked with a blanket around his waist, leaning on a rocky outcrop with wild plants at the base and holding on to his mandolin to his right and his left clenched hand by his chin. Signed and Dated: Victor Fucignas - 1897. 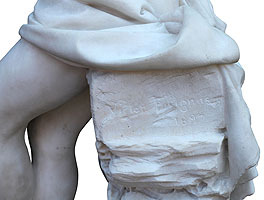 There is not much information available on Victor Fucingas other than he was an Italian sculptor based in Rome, Italy. He is also known by his carving of the Carrara marble altar at St. Francis Xavier Rectory in Brooklyn, New York.